Aluminum Current Capacity 125A to 500A. By utilizing skills of our experienced professionals, we are providing our prestigious clients with a qualitative assortment of Shrouded Bus Bar System. Owing to Features like high efficiency, low maintenance, and corrosion resistance, these systems are extensively demanded by our clients. Besides being fabricated using the high-grade material, these systems are tested thoroughly on a series of parameters to deliver best possible contentment from our end. 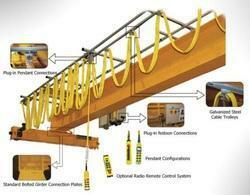 Embicon offers an insulated busbar for use in overhead cranes. This system comprises of 28, 30, and 41 series of C-rail cable trolley, wire-rope cable trolley and an i-beam cable trolley. In addition, the TR85 series of conductor rails offer both line A plug-in or line B continuous strip type system for this equipment. We are manufacturing crane control panel. with fuji and yasakawa make drive with readio remort and anti collosion system with 2 speed operating with all protection. with contactor base and braking system and thruster break system also. Embicon Tech Hub presents a series of highly durable, standard norms based Oldham Couplings. These are made up of Aluminum Alloy 6063-T6 and Derlin Material. However, for high temperature applications, these can be modeled of Teflon material. These coupling are used to reduce backlash of mechanism. These devices are used to join two rotating equipments in such a way that they permit some degree of misalignment or end movement or both. The main advantage of these couplings is their compact size. Currently, our range of Couplings is available in 25 mm, 32 mm, 43 mm and 53 mm. For special applications, we can design and make available in sizes as per request. The table given below offers the characteristics of the Couplings that we offer. For more details, please click on the product.